It's been a few months since I've completed anything, but "The Awakening" continues with a "floating" Necron Monolith. I like the use of turquoise featured in some of the pictures in the new codex, but wasn't a huge fan of making it a primary color. Instead, I've decided to incorporate it as an accent color along with the 'metal' look that is synonymous with Necrons. I love the fact that you actually put it on a base. The turquoise does a great job of breaking up the silver. I like it because you did more than boltgun metal. Inquisitor Wall wrote: I love the fact that you actually put it on a base. The turquoise does a great job of breaking up the silver. Thanks Kevin. Yeah, they are supposed to float, and to simulate it I used an upside-down GW paint pot (the ones that are octagonal?) with the cap removed, glued to an old CD. There is a flat washer in the recessed center underneath, and a magnet secured by green stuff on the paint pot. I think they used to come with flying stands, nice use of bits there Brian! Have you thought of painting some Necron Runes on the blue parts? I think that would look good, you can see them on the boltgun bits near the portal. It's amazing what you can accomplish when you actually have some free time. Now that I'm finished with school my time is much free'er. I finished another squad of Necron Destroyers to further fill out my Necron Army. I am also getting back to my gaming roots. 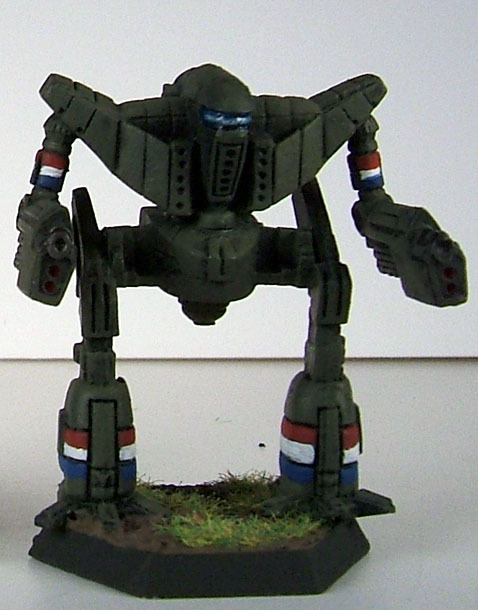 Battletech was my first and is still my most favorite game, but the time that it takes to play is a limiting factor for an afterwork/evening game, plus my usual gaming group is in another state. 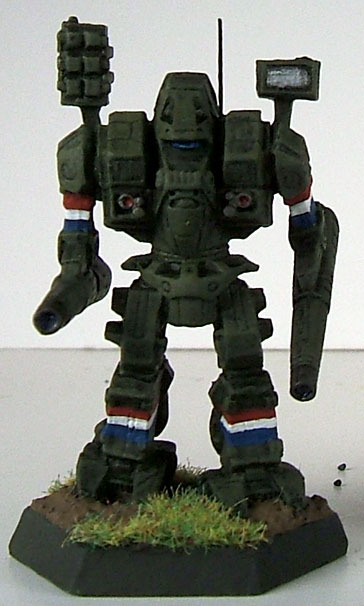 Having found some new people to play with at the 131 and a renewed interest in the game, I've started painting Battletech mini's again. My main Inner Sphere faction is the Federated Suns ruled by House Davion, and most of my mechs will be painted as those below. 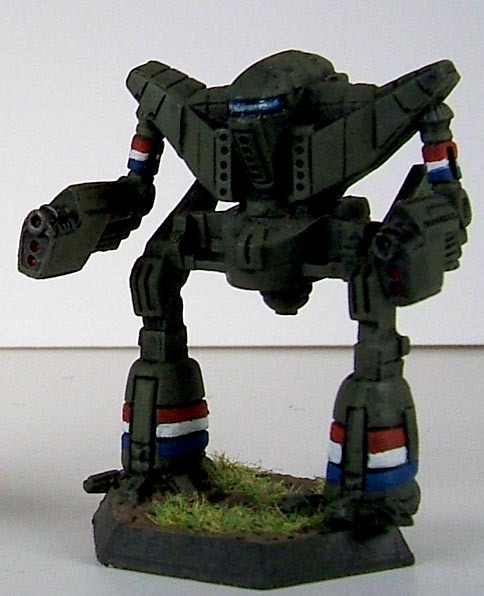 I do own mechs are are unique to other factions, but it is not outside the limits of the fluff to field them by any faction. It is easy to assume (in game) that they were acquired as salvage after a battle, and then repaired and put into service. I am thinking of painting them in a standard camo scheme. 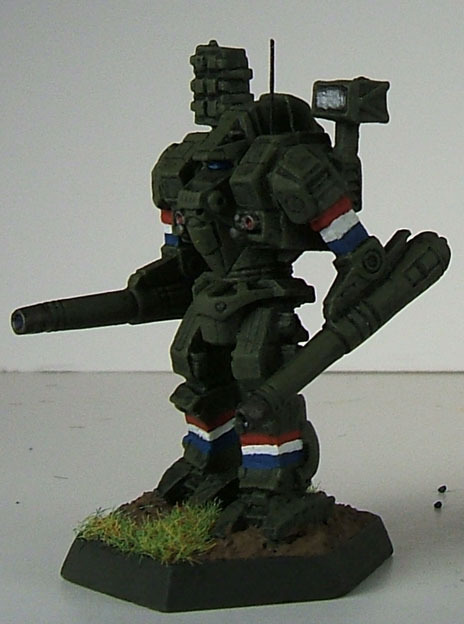 Painted in the livery of the 1st Crucis Lancers from the Federated Suns/House Davion. I would have added the Sword and Suburst emblem of House Davion and 1st Crucis Lancer's regimental logo, but my decals got lost in my last move. I have more on order but probably won't be here until next year.